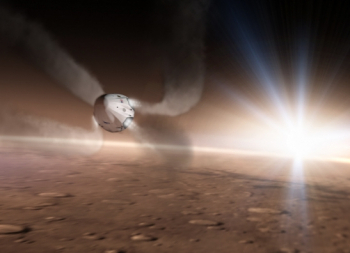 SpaceX’s Lars Hoffman stated his company’s continued advancements with its reusability goals are not only focused on reducing launch costs, but are aimed at providing a technology roadmap for its Martian goals. 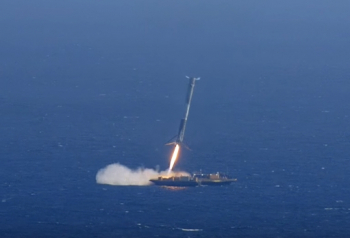 As the latest recovered Falcon 9 first stage sailed into Port Canaveral, Mr. Hoffman stated the recovery achievements are providing the tools for a transportation network to Mars. 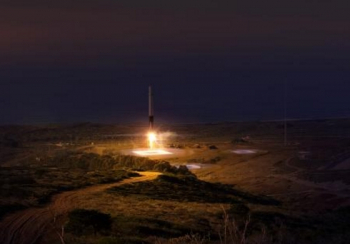 SpaceX has come a long way since it initiated a test program in 2013 at SpaceX’s test center at McGregor, Texas. Led by the Grasshopper test vehicle, its role was to test hardware elements such as propulsive targeted landing and its own preliminary landing legs structure. It also provided local cattle with something else to think about other than grazing. 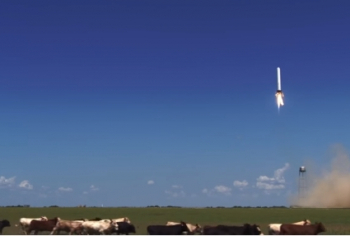 “This was in Texas and in Texas there’s a lot of cows and when the cattle see flame they run,” noted Mr. Hoffman Senior Director of Government Sales at SpaceX, pointing to a video of a Grasshopper test during his recent presentation at the Space Tech Expo in California. As the “Rocket Cows of McGregor” became more accustomed to the noise of the rockets, testing also matured via the F-9R Dev-1, which was literally pushed to the limit, as proven via its demise in the summer of 2014. However, the results provided the foundation for real life testing, as SpaceX made incremental advances towards the goal of recovering a flown Falcon 9 first stage. Referring to one of the early attempts to land a stage on the deck of the ASDS, Mr. Hoffman classed the April 2015 landing of the CRS-6 first stage as an advancement despite the loss of the rocket during its touchdown. “This one was successful. It may not look successful at first, because the fact we got it back to the drone ship at all was incredible,” noted Mr. Hoffman. 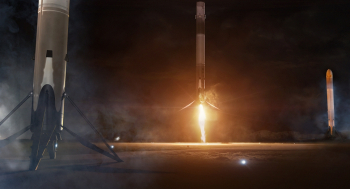 SpaceX would go on to finally achieve what is now four successful landings, one at its LZ-1 landing pad at Cape Canaveral and three on the ASDS. The latest stage to make it home was the Thaicom-8 first stage. 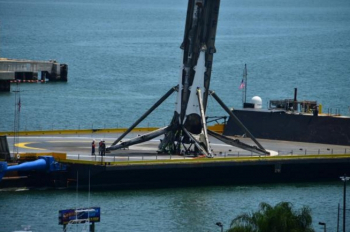 Despite its stressful return – resulting in a noticeable lean on deck – the rocket has now made it back to Port Canaveral on Thursday where it will undergo post-landing processing. So far, only one of the three previously recovered boosters is expected to be pressed into a potential relaunch attempt, pending a successful test fire program. The ultimate goal of reusability is obvious when considering the usual fate of a booster is a watery grave at the bottom of the ocean. 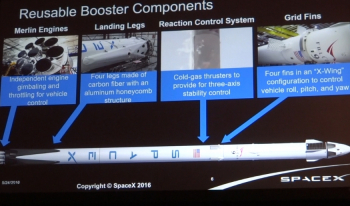 The new potential to reuse the booster for another launch promises large cost savings, but also numerous other benefits, as explained by Mr. Hoffman. “We believe reusability is a key and fundamental breakthrough to lower the cost of launch, but there are other benefits besides just lowering cost, which is what a lot of people focus on. “From our perspective, the benefits of getting a booster – or even a Dragon – is to be able to study it and understand what its endured during its flight and its return – which is actually more stressful for the vehicle. Also, each recovered booster – providing it can be refurbished for another flight – adds to the company’s inventory, ready to provide additional help in fulfilling the ever-growing order book. “Another benefit of recovering boosters is they add more flexibility into your launch capacity – and that’s very important to all of our customers; Commercial, Civil and Government. To have that flexibility, to be able to launch on short notice, is something they require,” added Mr. Hoffman. However, the cost savings remain the major positive factor. “As you bring a booster back and refurbish it for a fraction of the cost of building a new one, you are ultimately going to recoup those costs internally to recapitalize your investment to develop your capability. Long term, you’re going to be able to pass on those savings to all of your customers,” Mr. Hoffman continued. Lowering the costs and enabling a capability to a wider market will go some way to fulfilling that goal, while also strengthening SpaceX as it prepares to take the first steps towards Elon Musk’s dream of colonizing Mars. “The intent of the company is to revolutionize space travel, in fact the ‘mission’ of the company is to build a transportation system to Mars,” added Mr. Hoffman. “That’s a pretty high goal and to get there takes a lot of technology development that’s going to happen along the way and that’s going to benefit all of our customers. SpaceX recently announced they are partnering with NASA to send a Dragon spacecraft to the surface of Mars, while Mr. Musk is expected to reveal his plans for the Mars Colonial Transporter (MCT) – and associated architecture – this summer at the International Astronautical Conference in Guadalajara, Mexico. 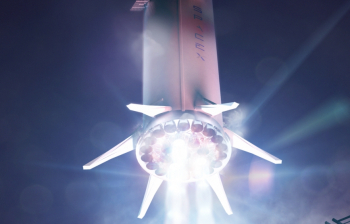 Like Falcon 9, Falcon Heavy and Dragon, the BFR’s huge booster is expected to be capable of landing for reuse, while MCT will be fully capable of Entry/Descent/Landing (EDL) techniques for both Mars and Earth. The technology being used on Falcon 9 today will directly feed into the Mars plans, which is set to involve the launch of humans on the MCT as early as 2024. “Some people ask why we chose these recovery methods,” Mr. Hoffman noted.